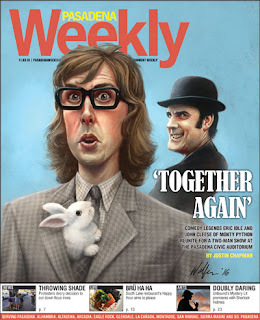 Read Justin's cover story on Eric Idle of Monty Python! 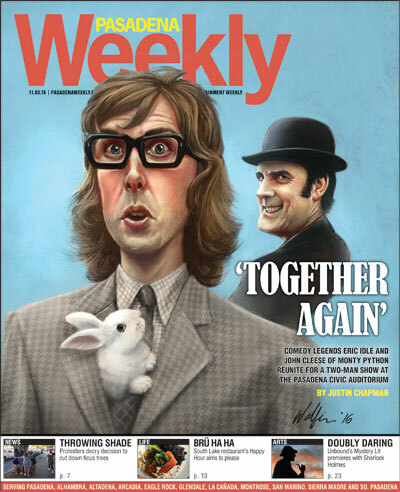 On Nov. 18, 2014, Eric Idle interviewed fellow Monty Python member John Cleese at the Alex Theatre in Glendale about his memoir, “So, Anyway …” The video was viewed more than a half-million times on YouTube, proving to Idle and Cleese that there is still a healthy appetite for everything Monty Python-related. Cleese got the idea to take their two-man show on the road. Following a successful run last fall on the East Coast as well as a sold-out run in Australia and New Zealand in February, “Together Again at Last ... For the Very First Time” has embarked on a third tour on the West Coast and Canada through at least Dec. 3, including a show at the Pasadena Civic Auditorium on Nov. 11. The show is partly scripted and partly improv, combining storytelling, sketches, musical numbers, exclusive footage and aquatic juggling. Although they haven’t performed the show since the Brexit vote, Idle said the topic will likely come up during the new tour because he was against the United Kingdom leaving the European Union and Cleese was in favor of it. The comedy icons have created a whole new act two for this tour that focuses on how Monty Python remained popular for more than a half-century and where they stand now. “We came off stage after [the original Alex Theatre show] and all we knew was that the audience had laughed a great deal and we couldn’t quite remember what we’d said,” Cleese said. Idle’s latest project is a musical Christmas special for the BBC called “The Entire Universe.” The show covers the entire history of the universe with “real science that’s interrupted by real silliness,” Idle said. “Everybody watches TV at Christmas because they get together with their relatives and they can’t stand each other so they get drunk and watch television,” he said. At the end Stephen Hawking sings “The Galaxy Song,” which Idle wrote for the 1983 film “Monty Python’s Meaning of Life.” Tim Peake, an astronaut who spent the summer on the International Space Station, also makes an appearance. After “Spamalot” premiered, the Pythons lost a lawsuit by Mark Forstater, a producer of the original film. The court ordered the Pythons to pay £800,000 in fees and back royalties to Forstater in 2013 because “Spamalot” was so similar to the film. To pay the settlement, the surviving members of Monty Python performed a reunion show in 2014 called “Monty Python Live (Mostly): One Down, Five to Go” at the 20,000-seat O2 Arena in London that sold out in 43.5 seconds. Founding Python members Michael Palin, Terry Jones, Terry Gilliam, Idle and Cleese all participated. The sixth founding member, Graham Chapman (no relation to the reporter), died in 1989 at the age of 48. Idle performed his fan-favorite song “Always Look on the Bright Side of Life” at the funeral. Following the 2014 reunion show, Palin made it clear to the rest of the group that he was no longer interested in doing Python shows. A few years ago, Jones began developing dementia, which was publicly announced in September. With Gilliam busy directing films, that left Idle and Cleese to carry on the Python banner. Idle pointed out that the upcoming performance of “Together Again” in Pasadena is practically a homecoming for the show that was born next door in Glendale. For tickets and more information, visit cleeseandidle.com.